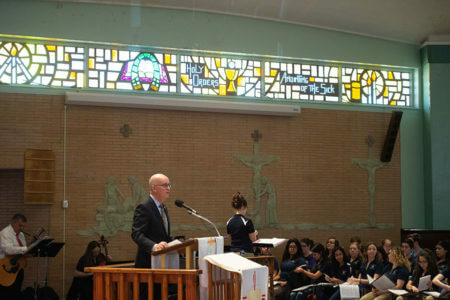 St. Mary’s University President Thomas M. Mengler, J.D., speaks during the Marianist Heritage Mass at Holy Rosary Catholic Church. The church is walking distance from St. Mary’s University. For 71 years, Holy Rosary Catholic Church and St. Mary’s University have been neighbors on San Antonio’s West Side. Literally steps apart, these two Marianist institutions have largely existed in parallel. Now, there are significant efforts to converge their futures — and strengthen the neighborhoods around them in the process. In 2014, the Most Rev. Gustavo García-Siller, M.Sp.S., Archbishop of San Antonio, approached St. Mary’s President Thomas Mengler, J.D., with an idea. Holy Rosary Parish had been dealing with an aging population and declining membership. So, García-Siller asked, how about the University and the archdiocese join together to build up Holy Rosary for youths and young adults? “It was an exciting idea because of our role in the neighborhood of educating young adults, helping them bring their talents and service to their communities,” Mengler said. And like that, the commitment to strengthen the spiritual landscape at St. Mary’s and the surrounding neighborhood, the Gateway District — especially for a younger demographic — was under way. Despite the statistics, the Marianist Province of the U.S. wasn’t deterred. The Province dedicated resources to breathe new life into the partnership, which would also help St. Mary’s meet its mission of fostering the formation of people in faith — including its students. The Rev. 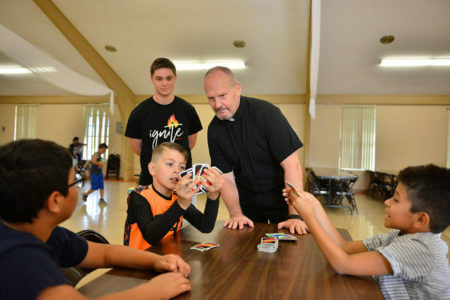 John Thompson, S.M., looks on as Holy Rosary Catholic Church summer campers play a game of UNO. To rededicate efforts in the diverse and burgeoning Southwest, the Marianists appointed Brother Mark Motz, S.M., as the national vocation director in 2017 and sent him to St. Mary’s University. In addition to Motz, the Rev. John Thompson, S.M., came to San Antonio that same year as the pastor at Holy Rosary. More reinforcements arrived: Brother Charles Johnson, S.M. ; Brother Esteban Reyes, S.M. ; and the Rev. Raymundo González, S.M. 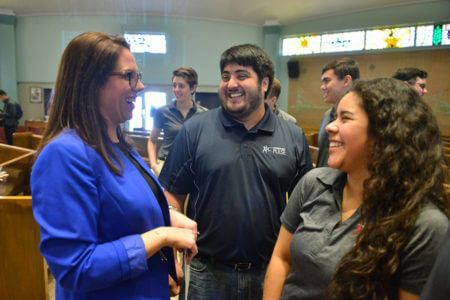 With a new team of Marianists at Holy Rosary, their mission — in addition to daily duties — was to create opportunities for young adults, especially Hispanics, to become more involved with the parish. Laura Dicun, sophomore Management major, a St. Mary’s University Summer of Service volunteer, plays with Holy Rosary summer campers. Laura Dicún, a sophomore Management major, didn’t expect the highlight of her first year as a summer camp counselor at Holy Rosary — one facet of the partnership — would involve a couple of shy kids. For Dicún, that experience was a bridge connecting her to the children and their families near the University. The free seven-week summer camp at Holy Rosary, run entirely by St. Mary’s students, launched in summer 2016, with Catholic Charities providing educational, training and support resources. The camp for children ages 7 to 17 living on the West Side has grown every year and alleviates summer child care costs for parents. “We (St. Mary’s, Catholic Charities and the Holy Rosary Parish Council) found there was a great need for a safe space for children in our community during the summer — a space for kids to continue to grow mentally, physically and spiritually,” said Clare Acosta Matos, Director of Civic Engagement at St. Mary’s. For three years, Acosta Matos has handpicked St. Mary’s students for a program called Summer of Service, which provides counselors for the camp. This past summer, six St. Mary’s students, including Dicún, planned and led activities from reading to making healthy snacks, and talked to campers about topics such as bullying and how to deescalate it. Acosta Matos said the counselors got a glimpse of life on the West Side, in turn becoming social justice advocates for those with whom they built relationships. 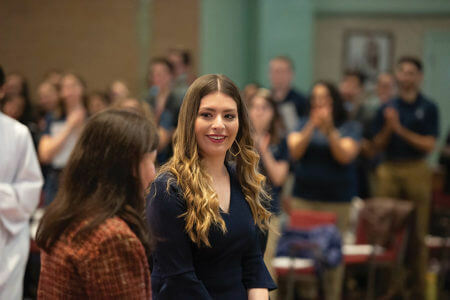 Iliana Mallett, senior Management major, joins in the Marianist Heritage Mass in January at Holy Rosary after being honored with a 2019 Marianist Heritage Student Leadership Award. Iliana Mallett, a senior Management major and recipient of the 2019 Marianist Heritage Student Leadership Award, served as a camp counselor in 2016 and 2017. The experience was so life-changing that she, with help from fellow students, founded a Girl Scout troop in the neighborhood. For the past year, Mallett’s troop of about a dozen girls ages 6 to 12 has met regularly and learned a lot. “A lot of them didn’t know about the community garden at St. Mary’s or about St. Mary’s in general,” she said. “Some of them had never tried blueberries, so we did a whole lesson on healthy living. (From left) Clare Acosta Matos, Director of Civic Engagement at St. Mary’s; Daniel Vasquez, Youth and Young Adult Minister at Holy Rosary; and Ximena Barbagelatta, freshman Marketing major, chat in Holy Rosary after Marianist Heritage Mass. For years, Holy Rosary was without a full-time, salaried youth and young adult minister. That changed in 2017, when Daniel Vasquez (B.A. ’12), who had volunteered and worshiped at the church while a St. Mary’s student, filled the void. “To do it well, youth ministry is a full-time job,” Vasquez said, whose long hours are filled with interacting with priests, religious brothers, youths and those from St. Mary’s. Tasked with developing programming for both youths and young adults ages 18 to 35 in the Gateway District, Vasquez admitted that young adults “are an extremely tough demographic to cater to” because they are often still figuring out their lives and careers. Vasquez has set two primary goals for now: Establish a strong network with St. Mary’s students and grow the youth faith formation group that meets every Sunday at Holy Rosary. Group attendance averages 35 high schoolers and middle schoolers. And who is running this group? St. Mary’s students, of course, such as freshman Mathematics major Jeanettee Uribe. The Dallas native wanted to continue her faith journey “without Mom or Dad telling me to” after she got to campus. She heard about Vasquez’s ministry while taking a St. Mary’s Core Curriculum class that required community service. She finished the requirement but continued assisting Vasquez, making deeper connections with neighborhood kids. “My Catholic faith is very important to me and, because I want to be a middle school math teacher, I’ve found the perfect spot working with Daniel,” Uribe said. “I’m not going to lie, at first, I was scared being thrown in a room with middle schoolers. But after getting to know them, talking to them about sacraments and playing games with them, they started coming not because they had to, but because they wanted to. 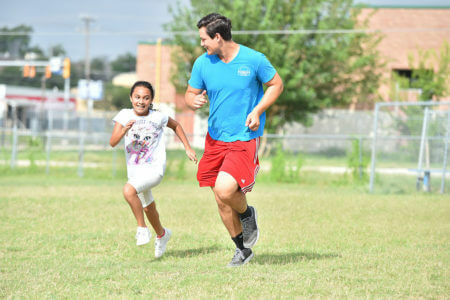 Teodoro “Alexis” Soto, senior Management major, a St. Mary’s University Summer of Service volunteer, races Holy Rosary summer camper Abigaile Garcia. In addition to student-volunteer manpower, Holy Rosary benefited from proceeds from the 2017 and 2018 StMU 5K for the Neighborhood totaling $35,000. Mengler said the money was earmarked to help upgrade their facilities. “I didn’t envision the 5Ks being so successful, so I give credit to the staff and students who engaged with our community and brought many people together,” he said. With a “partnership that is evolving,” Mengler cited Civic Engagement and the Marianist Leadership Program as leaders on the University front. Further partnership examples include Holy Rosary hosting the St. Mary’s Music Department’s Christmas Concert, the Opening School Liturgy Mass in the fall, and the Marianist Heritage Mass in the spring. “Music moves the heart, and if it works in tandem with the spoken word, it’s all for the better,” Thompson said. The priest’s open and joyous style is a key to the partnership’s success, Mengler said. “A partnership that includes a charismatic leader like Father Thompson, and we doing our parts, will advance the Marianist mission of helping form and develop our students grounded in faith,” he said.